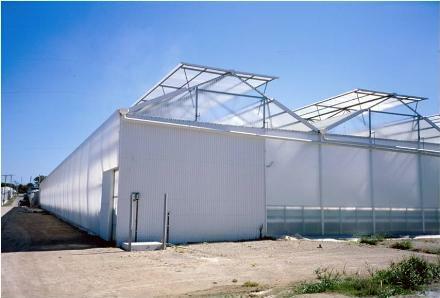 "The Ultimate in Crop Protection"
The 4x4 Polycarbonate greenhouses are computer analysed to provide full crop loading of 15 kg/m and at the same time resistance to wind loads of up to 50 metres per second. The 4x4 is easy and quick to build, the strength of a fully welded connection is combined with single sleeve joint systems to give a simple on-site assembly without the need for expensive scaffolding or cranes. As the polycarbonate comes in light weight sheets, our construction teams can continue working in conditions which would be unsuitable for covering a plastic or glass covered greenhouses. In the highly unlikely event that some of the polycarbonate is damaged, individual sheets can be easily replaced- you may even be able to buy a suitable sheet at your local building supplies store. The polycarbonate cladding we use is of the highest quality currently available, giving light transmission of over 90%. It is available with an optional light diffusing texture to reduce shadowing in the greenhouse and allow more light to the lower levels of plants such as tomato's. The product is also available with an optional anti-drip coating. We include both of these as standard. 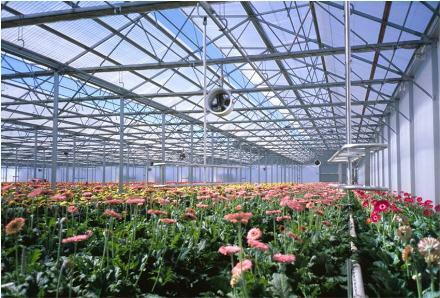 The polycarbonate has outstanding impact performance over a wide temperature range, -40°C to +120°C. In addition, the product is virtually unbreakable in case of storms, hail-stones etc. The hail simulation test shows that it can withstand hail stones with a typical diameter of 20mm at speeds higher than 21 m/s. There is no better protection for your valuable crop available on the market today. Ultra-strong profiled polycarbonate cladding gives the best possible hail protection. Column height is 4.125m at the gutter. Continuous vent hinge gives massive strength to the vent design while providing a highly effective seal against wet weather.